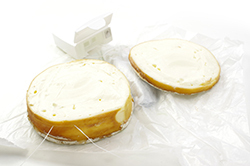 Score the goat cheese rind at 1/2-inch intervals and make 4 slices by pulling dental floss through the log. 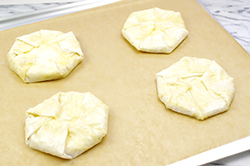 Place the stack of phyllo dough sheets on a cutting board and cover it with a slightly damp towel. 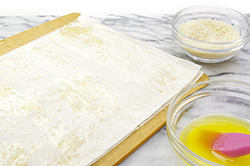 Place one sheet of phyllo on the board, brush it with butter, and sprinkle it with 3/4 teaspoon of bread crumbs. Place a second sheet of phyllo on top, brush it with butter, and sprinkle it with bread crumbs, continuing until you have 4 sheets of phyllo stacked up. Cut the phyllo in half crosswise to make two (7 x 8-1/2-inch) rectangles. Place a slice of goat cheese in the middle of one stack of phyllo, fold a corner diagonally over the cheese, and pleat the rest of the dough up and around the cheese, enclosing it completely. 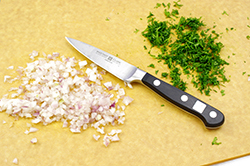 Place the package, folded side up, on a sheet pan lined with parchment paper. Repeat the process, until you have 4 packages filled with goat cheese. 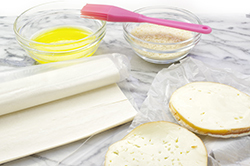 Brush the packages all over with melted butter, cover, and refrigerate until ready to bake. 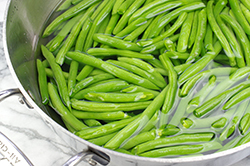 Bring a large pot of salted water to a boil and add the string beans. Simmer for exactly 3 minutes, until crisp-tender. 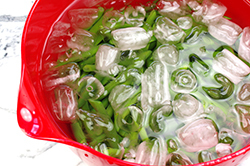 Drain immediately and immerse the beans in ice water to stop the cooking. Drain well. 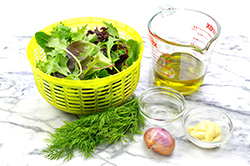 For the vinaigrette, whisk together the olive oil, vinegar, mustard, shallots, 1 teaspoon salt, and 1/2 teaspoon pepper. Stir in the dill and set aside. 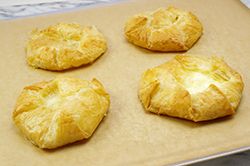 Bake the goat cheese packages for 15 to 20 minutes, until golden brown. Toss the string beans and mesclun with enough dressing to moisten. Divide the salad among 4 lunch plates, top each with a warm goat cheese package, and serve immediately. 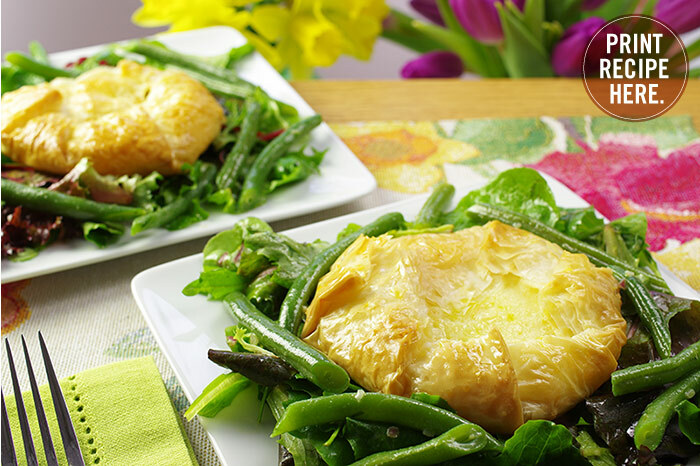 MAKE IT AHEAD: Assemble the goat cheese packages, cook the beans, and prepare the salad and vinaigrette; refrigerate separately for up to 2 days. 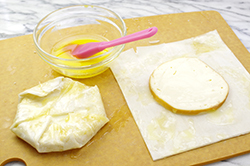 Before serving, bake the cheese packages, combine the salad and vinaigrette, and serve. French string beans are also called haricots verts. I use Athens phyllo dough.